When the Consumer Health Foundation (CHF) released its revised strategic plan last year, we did so to deepen our work on racial equity. Although racial equity has been a priority for the foundation since its inception, we were compelled to respond to the increasing national discourse on racism in America and the public resurgence of white supremacist ideology in the wake of our national election. For eight years, CHF had focused its grantmaking program on advocacy to create systems change. With this new strategic plan, we committed to increase our support for community organizing, a specific capacity needed by an advocacy field to advance a racial equity agenda. We also committed to using our own voice as an institution, especially as it relates to educating local governments about their role in advancing racial equity. In the process of developing our revised strategic plan, two issues emerged. The first was the role of racial justice in our work. The second was the addition of religion to our vision statement. From CHF’s perspective, there is a key difference between racial equity and racial justice. When we talk about equity, we often mean that groups of people (in this case, racial groups) have different abilities to thrive in this society. How many of you have seen the image of the three boys of different heights standing on equal-sized boxes attempting to watch a baseball game behind a tall fence? 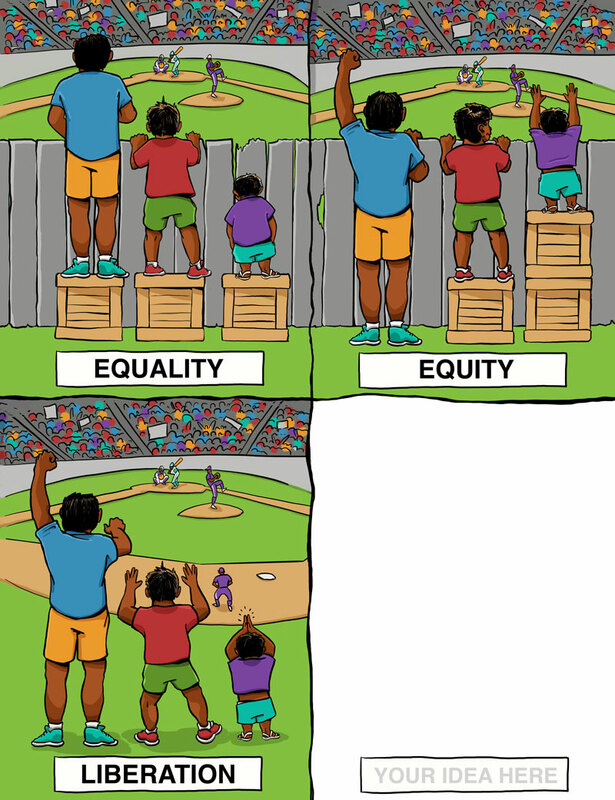 Equity suggests that the shortest boy get two boxes in order to see over the fence, while the tallest boy gets no box at all because he can already see over the fence. This strategy allows all three to see over the fence because the intervention is tailored to each boy’s unique needs. Justice, however, requires us to acknowledge the reasons why each boy is a different height. While height is a mostly genetic characteristic in real life, the boys’ different heights in this pictorial metaphor represent the various ways in which groups of people are situated in terms of social factors such as health, jobs, food, housing, and wealth. Justice requires us to ask how things got this way because we assume that, unlike height, how different racial groups fare has very little to do with genetics. In this case, the environment and the choices one can make in that environment play the most significant roles. Justice is also about power – the ability of the shorter boys to act on their own behalf to see above the fence or even to tear it down. For these reasons, CHF changed its mission statement to read: The mission of CHF is to advocate for racial equity and racial justice through programs and investments that advance the health and well-being of low-income communities and communities of color. We also added religion to our vision statement which now reads: We envision a region and a nation in which everyone lives a healthy and dignified life. By “everyone”, we mean all people regardless of race, ethnicity, immigration status, religion, gender identity, sexual orientation, disability, age, education or income. Although our Board of Trustees is fiercely committed to diversity, equity and inclusion, it took the recruitment of Darakshan Raja (a Muslim woman of color) to point out that religion was missing from the previous version. While this should not have been the case, it was a reminder that people from different walks of life who have experienced various forms of identity-based oppression must be at the table to help reshape the table. We hope that you will continue to take a look at your own organizations and identify opportunities for diversity, equity, inclusion and justice. Here are two tools that can help. $35,000 to provide general operating support and $5,000 to produce a report on residential segregation in Northern Virginia and its impact on health outcomes. To support the development of worker owned cooperatives in the District of Columbia. To advocate for and monitor the implementation of key reforms related to the CareFirst Blue Cross Blueshield Reform Project and Ending HIV/AIDS Plan.